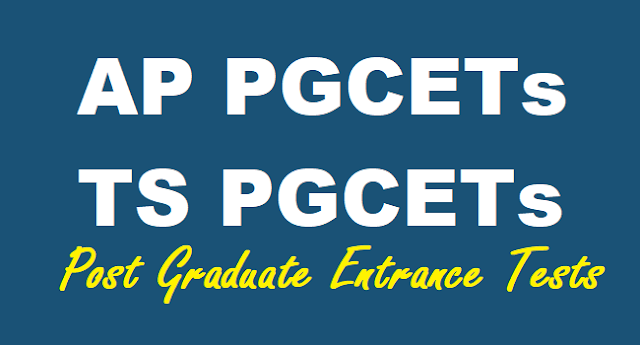 AP TS PGCETs 2019 /Common PG Entrance Test Notifications 2019 in AP, Telangana State, AP PG Entrance Tests 2019, TS Common PG Entrance Tests 2019, PG Entrance Test Notifications in AP and Telangana State - PG Courses in Various Universities: We can identify easily a work performed by a normal person and a skilled person. To do some particular work/job required knowledge about that is compulsory. Without knowledge and skill we cannot achieve good results with in less time. “Cooking” everyone feels this is a work which will be done by a women. But less members know that even men are working in the five star hotels as chef where he will manage to do all the food items required for that star hotel this is not a simple job and he cannot be paid easily, by his hard work and creativity he will earn lakhs of rupees by satisfying the customers by his food. Now, the days are changed as have a well – known saying “KADEDI KAVITHAKANARHAM”, in the same way “KADEDI SAMPADANAKU ANARHAM”. We can choose any option that which we are interested and earn/gain some knowledge, then you can proceed in your way sincere efforts makes the success bow before you. Make your parents happy and make them feel proud about you. So, choose your subject and gain knowledge them you can have a choice to do a job, business, research anything else. So, if you are a graduate you can pursue P.G in various universities, but you have to get through the entrance tests of that particular university. If you are only integrated course. Many universities in our Telugu states released the notifications for P.G courses eligibility for P.G degree students are eligible. The state council wants to go ahead with its decision to conduct the common entrance test. Students will not have to write PG entrance tests in each varsity if a common test in place and it would also ensure transparency in admissions, feel the authorities. The Telangana State Council for Higher Education (TSCHE) is firm on conducting common entrance test for admission to PG courses in different universities in the state. The varsities are requesting higher authorities to continue with the existing system under which each varsity will conduct its own test to fill seats in different PG courses under it. However, the state council wants to go ahead with its decision to conduct the common entrance test. Students will not have to write PG entrance tests in each varsity if a common test in place and it would also ensure transparency in admissions, feel the authorities. This year all universities released pg entrance test notifications for admission into various courses in its colleges for this academic year.